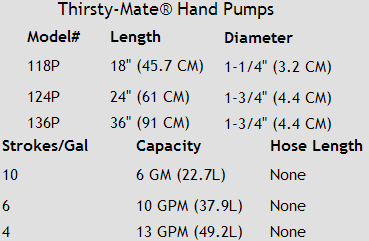 The Beckson THIRSTY-MATE ® hand pump is manufactured in the U.S.A. of the finest materials available. It is self-priming and very easy to clean. This hand pump will not rust or corrode or mar your boat. If your THIRSTY-MATE ® hand pump becomes clogged, simply remove the foot valve assembly and clean out the inside. Spare parts such as replacement foot valve assemblies and hoses are readily available.